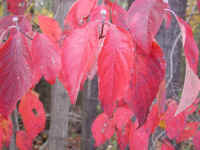 (Leaf Peeper's Dream - Flowering Dogwood - 01) Usually, we only think about the white bloom on the flowering dogwood in the spring, but as we can see, these bright red leaves also brighten the woodlands in the fall. 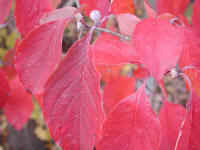 (Leaf Peeper's Dream - Flowering Dogwood - 02) This is a closer look at a few of the autumn red leaves of the flowering dogwood. 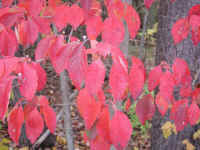 (Leaf Peeper's Dream - Flowering Dogwood - 03) The bright red autumn leaves of the flowering dogwood brighten the edge of the woods. 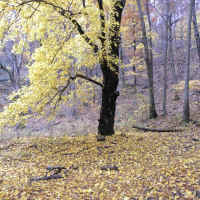 (Leaf Peeper's Dream - Forsythia - 01) We usually think of the early spring bright yellow flowers as being the forsythia's only attraction. 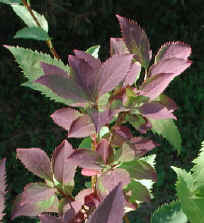 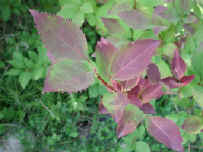 For the rest of the growing season, it's just another green-leafed shrub; but autumn adds its purplish blush. 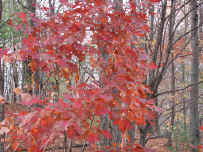 (Leaf Peeper's Dream - Forsythia - 02) The autumn colors of the forsythia are an unexpected attraction, almost like a second blooming. 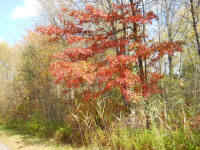 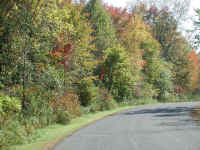 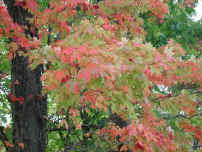 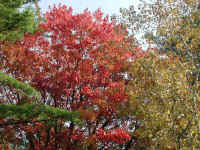 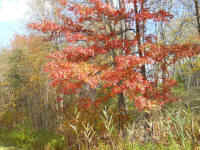 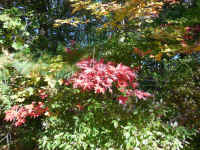 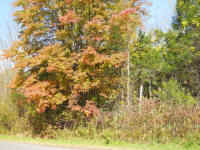 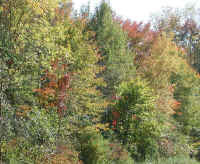 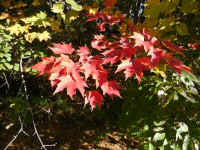 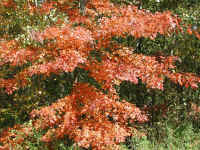 (Leaf Peeper's Dream - Maple - 01) Like sentinels standing on the side of the road, the maples display their multi-colored autumn uniforms. 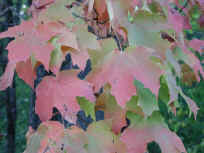 (Leaf Peeper's Dream - Maple - 02) Just as no two human fingerprints are exactly alike, so these colorful maple leaves present their own uniqueness. 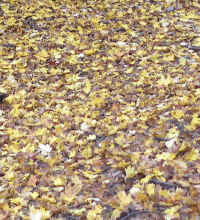 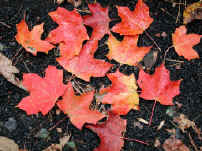 (Leaf Peeper's Dream - Maple - 03) The overnight wind and rain brought down many colorful maple leaves, depositing them on our walkway. 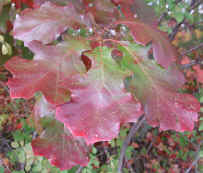 (Leaf Peeper's Dream - Oak - 01) We couldn't resist photographing this oak leaf cluster. 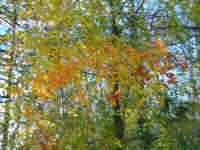 The way it hung down from one of the tree's limbs, it was like an autumn greeting. 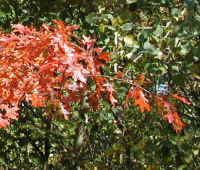 (Leaf Peeper's Dream - Oak - 02) After most of the brilliantly colored maple leaves have fallen, the splendor of the oaks hold center stage. 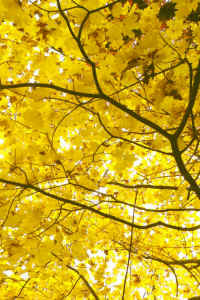 It's their turn to lighten our hearts with the glory of God's creation. 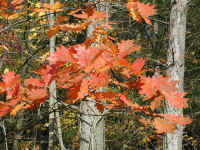 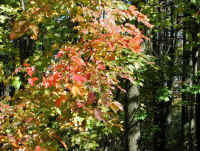 (Leaf Peeper's Dream - Oak - 03) The gray tree trunks offer a contrast to the bright autumn colors of these oak leaves. 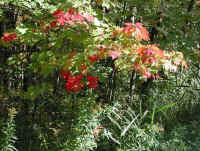 The vines climbing up the tree trunks are poison ivy. 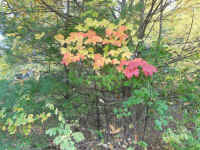 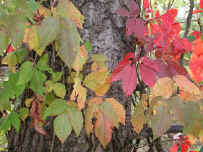 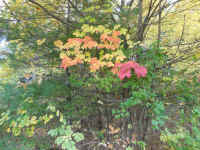 (Leaf Peeper's Dream - Poison Ivy - 01) In this photo, the poison ivy puts on a modest autumn blush of color. 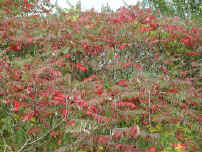 It's almost as if it's in competition with the woodbine (bright red, five leaf clusters) for space and beauty on this tree. 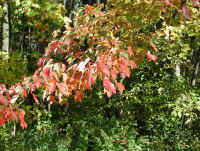 (Leaf Peeper's Dream - Poison Ivy - 02) The poison ivy has now come into its own deep red fall color. 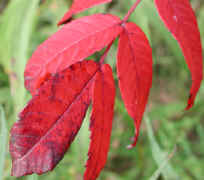 (Leaf Peeper's Dream - Sumac - 01) Sumac seem to be nature's bellwether of the approach of autumn, for they are one of the first to put on their colorful blush. 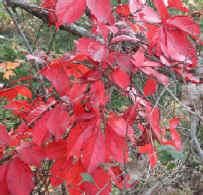 (Leaf Peeper's Dream - Sumac - 02) This is a close up view of the bright red color of a few of the sumac leaves. 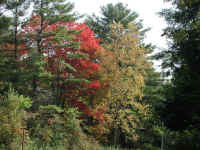 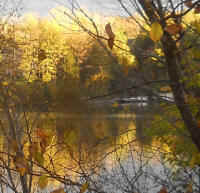 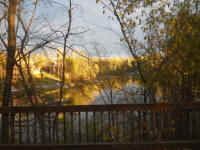 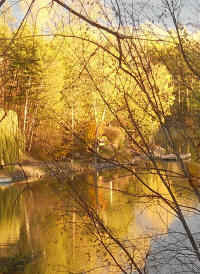 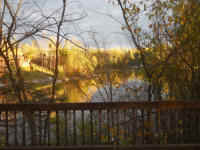 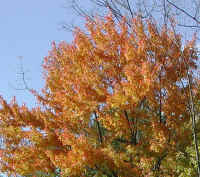 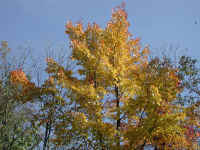 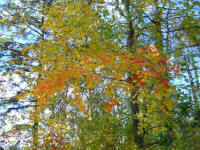 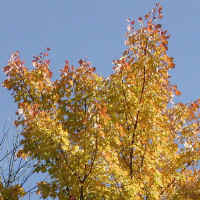 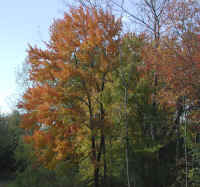 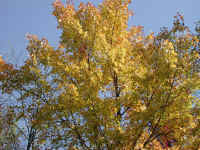 (Leaf Peeper's Dream - Tamarack - 01) The tamarack tree has inch-long bright green needles that turn yellow in the autumn. 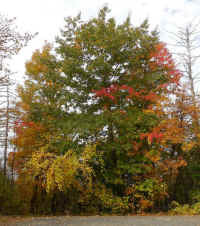 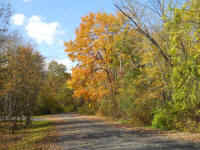 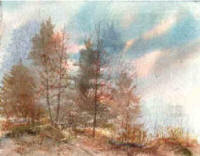 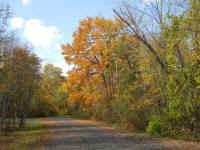 In late autumn the needles fall just as the leaves do from deciduous trees. 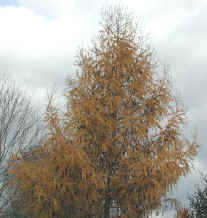 The tamarack is also known as hackmatack or American larch. 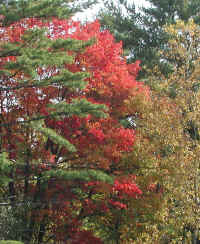 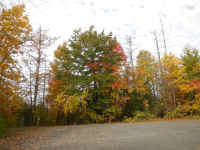 (Leaf Peeper's Dream - Woodbine - 01) Like a stop sign on a road, the woodbine's bright red color calls leaf peepers to stop and gaze at its autumn splendor.